Au-delà des images...: Holidays are really behind us... Fini le temps des fêtes! Holidays are really behind us... Fini le temps des fêtes! 2011 is already 10 days old! I removed all outside decorations on the 2nd, the weather was just perfect. For some reason, I left my Christmas tree until yesterday! This is a very new attitude for me. I guess I am getting closer to a real reconciliation with the Holidays! It's a big step, the first one was participating in Christmas all year long blog hop, all through2010! I must confess I have never been a Christmas Holiday person, more the kind to hibernate on the 24 and wake up on the 2nd! All good things have an end, and if crafting is a therapy for me, this card I started before Christmas is very representative of how it helps me letting my feelings inspire me. With Tilda and Edwin, I offered my Christmas wishes HERE; I saluted 2010 and the in between week HERE; and, finally welcomed 2011 with Tilda taking along the New Year and my dancing little couple rejoycing HERE! Closing celebrations is in the order of things, and I asked Wilma to help me carry the message. I decorated the back of my card, bearing the word "FIN" (the end) like the last screen of a movie. Since all the other panels were inside the house, I decided this one would show the same window from the outside. .. I stamped and embossed in black this wonderful background from IMpression Obsession on watercolor paper. I colored with distress inks in Antique linen, pumice stone, black soot, and Stampin up Going grey and Sahara Sand. I sprayed with a bit of perfect pearl and water to give a glitter look. The window stamp is the same, from Stampin Up set A ma fenêtre; stamped, embossed and colored with acrylic paint. I used a lamp sticker to give the impression of a real window and decorated with glitter. Wilma and the post are from Magolia stamps, (I can't see them at Magnolia-licious, however, Diana will be pleased to inform you as to their availability); both colored with copics, and acrylic glitter paint for the post. Thelittle light garland is an embossing folder from Cuttlebug, on which I used Stickles in green, red and silver for the lights. The snow is white cardstock sprayed with glimmer mist in Pear and Spanish moss. The snow on the post and window sill is flower soft. Thank you so much for dropping by, and letting me know what you think. Your kind messages have the same effect as sunshine in my day! 2011 a déjà 10 jours! Cette fin de semaine, j'ai rangé toutes les décorations de Noël, mon salon a retrouvé son air habituel! Il n'y a maintenant presque plus de traces des fêtes. Ce qui est particulier cette année, c'est que j'ai conservé mon sapin beaucoup plus longtemps, faut croire que je me réconcilie tranquillement avec les fêtes. C'est probablement une conséquence du défi de Magnolia-licious Chrismas All year long,puisque chaque mois je me remettais doucement dans l'esprit des fêtes histoire de créer une carte! Comme toute bonne chose a une fin, je tenais à souligner que vraiment le temps des fêtes est derrière nous. Je vous ai offert mes voeux avec celui-ci; j'ai pris le temps de saluer 2010 avec celui-ci; et d'annoncer l'arrivée de 2011 avec celui-ci. Alors, que dire de décorer l'endos de la carte ...comme dans un film, avec le mot "fin"? Voici donc ma version. J'ai étampé et embossé à la poudre noire l'étampe de fonds de Impression Obsession sur un papier aquarelle; j'ai utilisé les encres distress suivantes: Antique linen, Pumice stone et Black soot ainsi que celles de Stampin Up: sable du sahara et grisonnant. Le tout vaporisé avec un peu d'eau mêlée à du perfect pearl. La fenêtre, toujours la même étampe, du jeu de SU A ma fenêtre, embossée en noir et peinte à l'acrylique. Pour donner l'illusion de vie derrière la fenêtre, j'ai collé un collant lampadaire, ajouté des brillants et des Stickles. L'affiche et Wilma sont de Magnolia (je ne les vois pas présentement chez Magnolialicious mais Diana peut certainement vous renseigner quant à la disponibilité future). J,ai colorié au Copic, et pour l'affiche, j'ai ajouté de l'acrylique scintillant et embossé le mot "fin" à la poudre noire. Un carton blanc vaporisé de Glimmer mist, en blanc perle et Spanish moss, déchiré et enduit de Stickles a servi à créer la neige. J'ai ajouté aux pattes de Wilma un peu de flower soft blanc, ainsi que sur le bord de la fenêtre et au dessus de l'affiche. Créer est une thérapie bienfaisante pour moi, et cette carte en est un exemple parfait. Le temps des fêtes en 4 tableaux dans lesquels j'ai laissé parler mes sentiments. J,espère que cela vous a plu. Merci de me visiter, et de me laisser un mot. Vous lire est un rayon de soleil dans ma journée. tu as toujours de bonnes et belles idées! Wow Danielle, j'adore ta carte. Le fini fait avec l'étampe de fonds est génial, Super!! Leuk dat je zo binnen kan kijken langs de venster...heel knap gedaan.Ook de sneeuw op de vensterbank en bij de hond!Een super idee! Ik begrijp je helemaal...het is voor het eerst dat de Kerstboom nog steeds versierd staat in de huiskamer...nostalgie is het denk ik...dat krijg je als je wat ouder word!LOL! I love the little house you made Danielle! Wilma looks adorable. The snow is amazing. Really stunning card. I love how you think outside the box! Danielle!!! You always are so creative!! What a wonderful idea!! I don´t know what to say!! 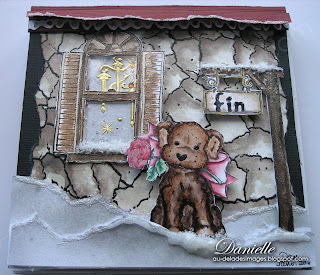 This card is so gorgeous, the background is wonderful with the distress and your coloring is absolutely fantastic!!! I enjoy each element you add in the scene you made. Ta carte est magnifique! j'adore ton mur de briques!!! bravo! How lovely! But I just want to take Wilma home...do you think she's cold? 'Cuz it is COLD here today! First snowstorm of the season! Darling card. The torn paper "snow" effect is really pretty. Ok Danielle - let's see if I can copy this just right "j'adore ta carte" Wow! So cute and you my dear are extremely creative -- I love your art work! Quand on dit que ça frise la perfection...eh bien! c'est ça la perfection!!! Tu as vraiment l'art de la colorisation et de la mise en scène. C'est un pur bonheur pour nos yeux! Wow Danielle! What a wonderful scene. Love the decorations in the window. The house looks awesome and colored so beautifully. Little Wilma sitting there looks so cute and the pink rose just gives enough color to this gorgeous picture. love how you did the snow too. Hi Dani! This is so delightful and at last we get to see the final panel of your awesome scene-scape! 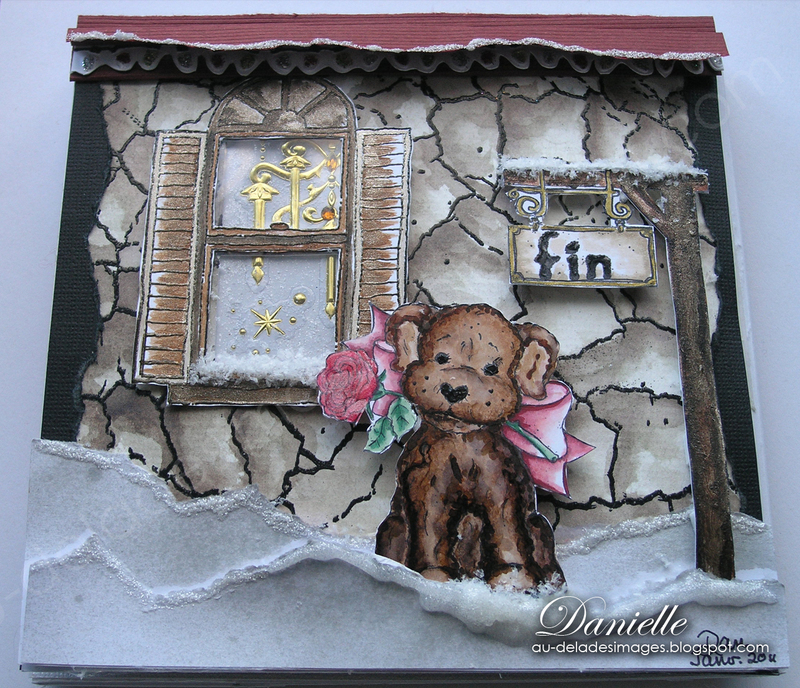 Your creativity with this card is fabulous, the stone wall, the snow the windows...excellent!!!! LOVE IT Danielle!!! Love the outside of the house and the glimpse of a light fixture!! I totally love this little work of art. You did an awesome job with the distress inks! The flower soft is the perfect touch and, of course, Wilma is adorable. This is an awesome project, especially since you didn't know what to craft. You know, sometime some of the best things come from spontaneity and not really having a plan. Thats pure creativeness. Such a cool share! Je suis presque triste de voir le mot fin sur cette création qui a su me tenir en haleine pendant plusieurs semaines. Ton imagination est débordante, c'est merveilleux pour nous les bloggeuses. Bravo ce fut un délice de suivre cette histoire en 4 tableaux. Une carte parfaite à tous les points de vue! Danielle! OOOOOOOhhhh! This is GORGEOUS and a work of art@ I love that house you made and everything is coloured BEAUTIFULLY! I love love love this! You are an inspiration! so cute Danielle! What an adorable card and fun progression through the Christmas/New Year season! Wonderful coloring and designing! thanks for sharing and inspiring! I might like this portion of your card the best! What a story you have told thorough out your wonderful work! Your house looks wonderful the way you have painted it! I love the light fixture in the window. Wilma is so cute waiting outside with her rose gift for you. You have a delightful imagination and I have enjoyed so much following this card to it's completion. aahhh Danielle how did you do that? iam stitting here and try to find out what colors you used..
this is soooo pretty. even those golden elements int he window frame. Ah what a beautiful card. I love the dog - he's very cute. I hope you had a Lovely Christmas and Happy New Year to you. How creative is that??!!! What a fun card you've made Danielle! Loved all the wonderful details you've done!!! C'est triste de mettre cette beauté de chef d'oeuvre en arrière d'une carte. Le 3D J'aime beaucoup! Mais je n'est pas beaucoup expérimenté, mon prochain défi. Un petit plis rehaussé de neige un autre qui fait le toit, un pop up pour la fenêtre donne un résultat parfais. Stunning Danielle! I love the window with the lighting showing, very creative. Beautiful work! WOW Danielle, amazing card, absolutely beautiful. Wow! Votre carte est délicieuse!!! I just love the snow effects, the coloring, the wall behind Wilma, well it looks like an awesome winter wonderland scene to me. You've put some work into it but it payed off. Just Great!